One way to foster a love of reading in your child is to make reading convenient. Provide special reading nooks and spaces for your child to read – make it comfortable, make it playful, make it creative – design areas that invite your child to relax with a book in hand. You don’t need a huge space – even just a little corner or two will do. Imagine the possibilities – a warm throw rug, a mini table and chairs, a lamp, a bookshelf, a stack of books, and perhaps an upholstered child-sized chair of her own. 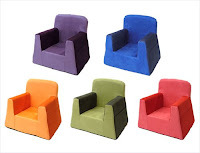 P’kolino (pronounced pee-ko-lee-no) offers colorful, stylish, well-made play furniture for kids. Two dads created the company in 2004 and they’ve been adding to their collection ever since. P’kolino’s items are one-of-a-kind and have that chic European feel. J.B. Schneider, one of the founders of P’kolino, believes that “it is important to have young children ‘read’ on their own even before they can read. Books where the pictures tell t he story are a great start. They let the child create the story in their mind (as if they we reading).” Creating a space for them to do that is key…and, if you want to add a piece or two of play furniture to your area, P’kolino might be just what you’re looking for. 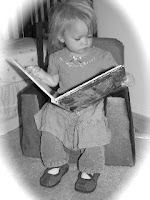 Want to purchase a Little Reader of your own? You can buy one for $95 on the P’kolino site (you can get free shipping on your order right now). Need more info? Watch the video about the Little Reader, but beware – I guarantee you’ll want one. I love these and what a great idea to make a reading nook. I’m already planning how to do the girls room when they outgrow the small room and move to the guest room, I’ll have to incorporate a nook, oh wait, I already have thought of the window seat/bookstand. Well, something in the basement then. 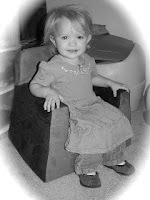 We have a cute little comfy chair for our daughter, too, and she loves it. The only problem comes when her friends or young cousins come over and they fight over who gets to sit in it.